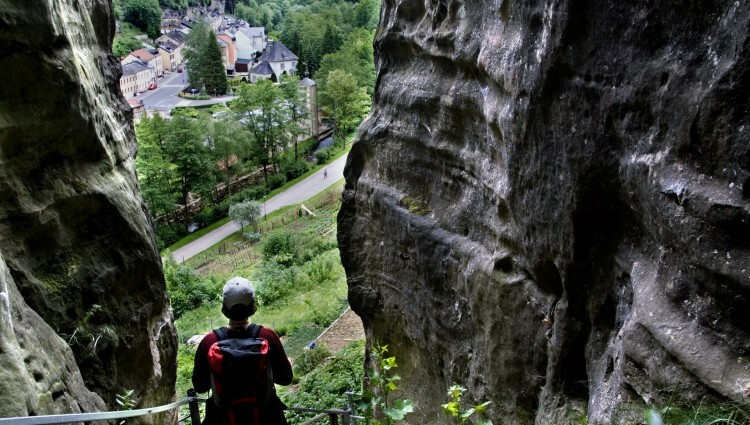 The ruins of Larochette Castle are perched on a sandstone promontory 150 metres above the Valley of the White Ernz, a tributary of the river Sûre. The castle is accessed via a large bailey protected by a mound. The main castle, built in dressed stone is encircled by a rampart which today is largely destroyed. A deep ditch, partly of natural origin, divides the castle in two halves. On the extreme tip of the promontory, the remnants of several stately mansions bear witness of the sumptuous architectural quality of this castle. 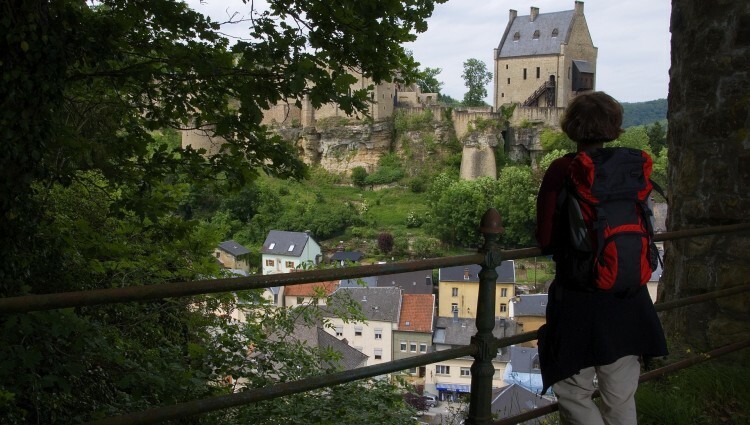 Since the acquisition of the castle in 1979 by the Luxembourg State, Larochette underwent important restorations. Photogrammetric images taken soon after the castle purchase have been supplemented by ongoing archaeological studies. 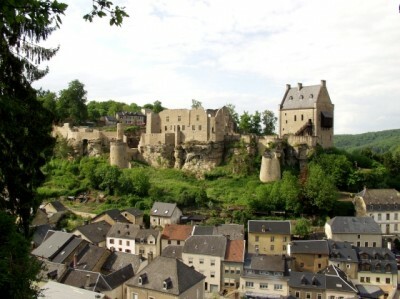 The lords of Larochette first appear towards the end of the 12th Century as standard-bearers to the House of Luxembourg. 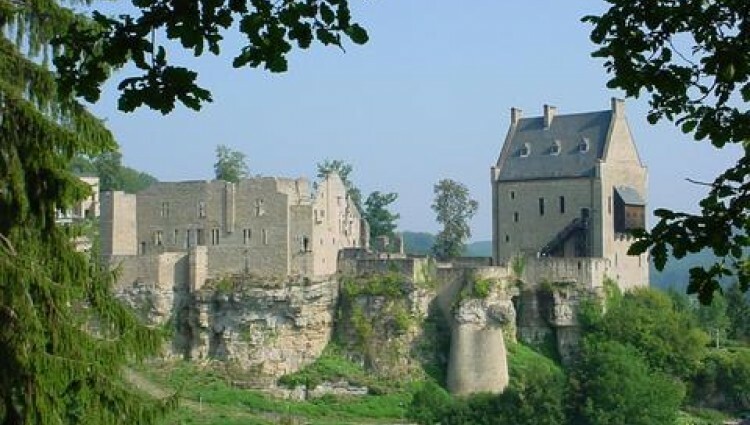 Towards the late 14th Century, five separate grand families live within the castle. The House of Homburg was built around 1350 as a result of the alliance of the brothers Frederic and Conrad, lords of Homburg, with the sisters Irmgard and Matilda of Larochette. The House of Créhange was built around 1385. At the end of the 16th Century, the castle burned down and has been a ruin ever since. The House of Créhange -of high architectural quality- was restored between 1983 and 1987. The House of Homburg was consolidated and restored in the years 1987 and 1988. At the same time, substantial excavation and clearing works were undertaken. The resulting data from these archaeological explorations will help us to fully understand the history of the castle. 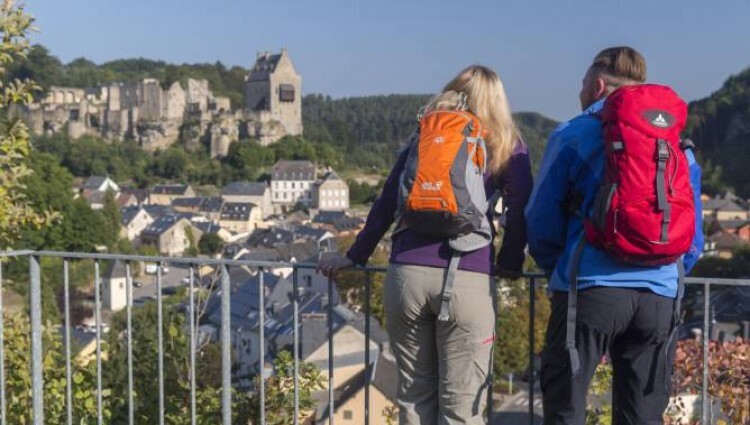 High on a promontory of Luxembourg sandstone, the ruins of Larochette Castle dominate the valley of the White Ernz, a confluence of the river Sure. One can reach this promontory through a large farmyard protected by an earth fortification. The main castle, built of sandstone, is surrounded by a wall, mostly destroyed today. A deep ditch, partly of natural origin, cuts the castle in two. At the far end of the promontory, the ruins of several seigniorial mansions witness the quality of the architecture of this castle. 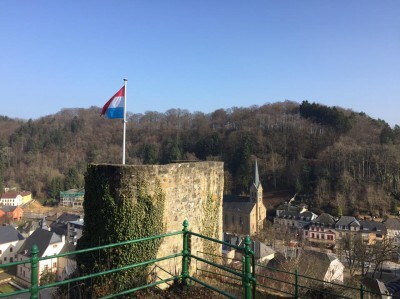 Since its acquisition by the Luxembourg state in 1979, this historical part of Larochette has seen numerous restorations and valuations. Photogrammetical pictures taken at the purchase of the castle were completed by archeological studies still continuing. The Lords of Larochette are first mentioned at the end of the XII century, among others as banner carrier for the House of Luxembourg. 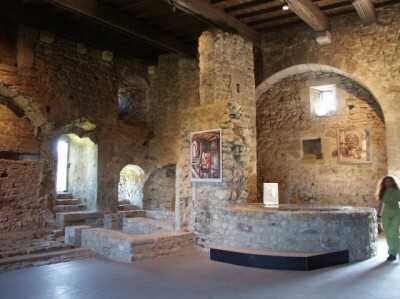 At the end of the XIV century, 5 seigniorial houses stood inside the walls of the castle. The Hombourg Mansion was constructed around 1350 as the brothers Frederic and Conrad, Lords of Hombourg, married the sisters Irmgard and Mathilde of Larochette. The Crehange House was built around 1385. At the end of the XVI century however, the castle was destroyed by a fire and remained in ruins. The Crehange House, of formidable architecture, was restored from 1983 to 1987. The Hombourg Mansion is still being consolidated. Besides the restoration and consolidation, vast excavations took place all over the area of the castle. The results of this archeological founds will allow to complete the knowledge about the history of the castle. 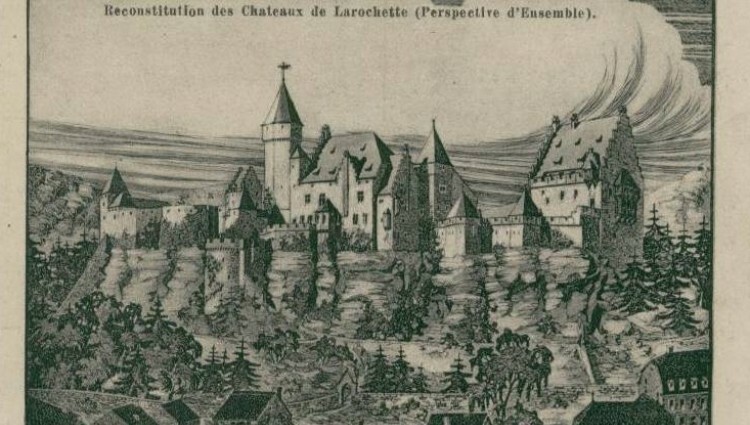 It seems as if the origins of the Lords of Larochette were in Ouren. They became very influent and, from the XIIIth century, they were the most true vassals of the Count of Luxembourg. The German Emperor Wenceslas even allowed the Lords of Fels to have their own money in 1402. Inside the Castle, in the "Créhange House", a deep well is carved into the massive stone rocks. A legend tells of the Lady who panicked as the enemy stormed the castle. She sprang into the well along with her infant child. Impressed of so much heroic courage, the aggressors stopped and they rescued the innocent victims from the well. As they needed a guilty party for the disgrace, they found the steward of the castle, who through his treachery had made the storming possible. They threw him into the well. The steward was transformed into a dragon who watches over the gold which he took in payment for his betrayal, and which lies in the well. Apparently on each good Friday he awakes and emerges from the well at midnight and leads off a hellish round in the castle's keep. Do you wish to receive free information in the future? The rock with tower "Verlorenkost"
At the rocky promontory opposite on the south side of the castle is an old watchtower named "Verlorenkost”. The funny name means "lost food" and the story tells that during the construction a cook carried the meals to the builders. She stumbled and smashed the pots with the food. The food (kost) was then lost (verloren) giving the tower its name which it still retains today. Another story says that the tower could never be used as a watchtower as it stands on the wrong place. The building was thus a "lost cost".